This video explains the differences in pronunciation and vocabulary among Mandarin Dialects(Std. Mandarin, Szechuan Mandarin and NE Mandarin) and Cantonese. Linguists classify these varieties as the Sinitic branch of the Sino-Tibetan language family. Within this broad classification, there are between seven and fourteen subgroups, depending on the classification. (shown here with the romanized Standard Chinese names of the categories, ordered alphabetically). Matisoff's list uses the common English names of the groups, ordered by decreasing number of speakers of languages within the group. In addition to the varieties listed below, it is customary to speak informally of dialects of each province (such as Sichuan dialect and Hainan dialect). These designations do not generally correspond to classifications used by linguists, but each nevertheless has characteristics of its own. The main dialect areas of Gan in Mainland China. The eight main dialect areas of Mandarin in Mainland China. Sometimes a subcategory of Mandarin. The main dialect areas of Min in Mainland China, Hainan and Taiwan. The main dialect areas of Wu in Mainland China. Language map of Hunan Province. New Xiang is orange, Old Xiang yellow, and Chen-Xu Xiang red. Non-Xiang languages are (clockwise from top right) Gan (purple), Hakka (pink along the right), Xiangnan Tuhua (dark green), Waxianghua (dark blue on the left), and Southwestern Mandarin (light blue, medium blue, light green on the left; part of dark green). The main dialect areas of Cantonese (Yue) in Mainland China, Hong Kong, Macau. In addition to the varieties within the Sinitic branch of Sino-Tibetan, a number of mixed languages also exist that comprise elements of one or more Chinese varieties with other languages. Shaozhou Tuhua 韶州土话 韶州土話 A group of distinctive Chinese dialects in South China, including Yuebei Tuhua and Xiangnan Tuhua. It incorporates several Chinese dialects, as well as Yao languages. Waxiang 瓦乡话 瓦鄉話 An independent Chinese dialect. It incorporates Chen-Xu Xiang and Qo-Xiong Miao languages. In the list below, local dialects are not listed. Groups are in bold, subgroups are numbered, and clusters are bulleted. 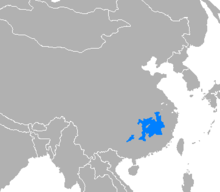 ^ For example, though the Southwestern Mandarin of Chengdu is intelligible to speakers of Standard Chinese, other local variants of Southwestern Mandarin may not be mutually intelligible to each other. This page was last edited on 20 March 2019, at 14:24 (UTC).